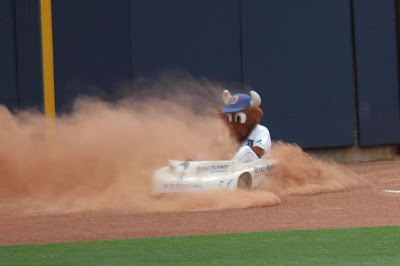 Pretty spectacular trip that left the Bulls with the best record in the International League and 14 games ahead of Charlotte in the South Division. Although a late inning loss, yesterday afternoon’s game appears to have been very well-played. Considering that the Bulls were outhit 12-5 the one run loss, even in the bottom of the 9th, is more a testimony to great defense and pretty good pitching than anything else. As always, pleased to see Elliot Johnson have a good night. Regarding Dan Johnson, I thought there might be some interest in this look forward from one of the stats-oriented sites. And then there’s this item that implies that Dan won’t be coming back any time soon. Dan played first last night and drew two walks in 4 trips to the plate. Here’s a cryptic bit of information from Rays Prospect. Potential Bull reliever if Abreu gets called up? The last time we looked at Bulls pitching was a couple of weeks ago. Not too much has changed since then. 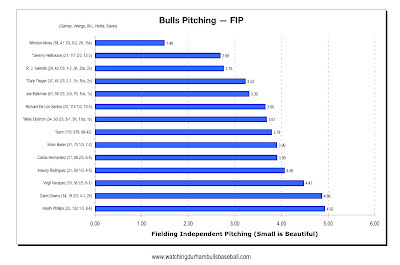 But the table that compares changes in FIP shows that Baker, Thayer, and Vasquez have slipped some, but that is mostly attributable to single outings (Baker and Vasquez). Given the job that the whole relief crew did yesterday, can’t be too worried about pitching just yet. For us, I hate Dan Johnson going up. But there's no one more deserving of the chance on our team (although I've got a couple of other guys high on my list of prospects to go up this season). I'm so glad we had the opportunity to see Dan play. Best luck to him!!! I hope like hell it isn't 107 heat index at game time Thursday... caught some weather report on the radio this aft that said it might be. I'm worried that teams have figured out Swindle. That's my biggest pitching worry. I have similar worries about R.J. His last couple of times out haven't been his best. Still, his overall numbers remain very good. Guess Dan's game-tying hit might have made some sort of mark last night. Hard to tell. Maddon's management style has never made any sense to me, so not surprised Dan got pulled. Wonder if he'll play this afternoon? Sort of expected Anderson, surprised with McGee. Will have to chase down some background. Hellickson Not Pitching Today (Sunday)? Last Chance To See Hellickson?